Review an example of creating REST Enabled SQL service reference on a remote database. The following example builds a fictional REST Enabled SQL service reference named SCOTT_OBE Example using the Base URL http://server.example.com:8080/ords/scott_obe. Before creating a REST enabled SQL reference, developers must complete the requirements described in "Before You Begin: REST Enabled SQL Service Requirements". Under Data Sources (bottom left of the page) select REST Enabled SQL. On the REST Enabled SQL page, click Create. Name - Enter a descriptive name for this REST Enabled SQL service. For example: SCOTT_OBE Example. Credentials - Select an existing credential to authenticate against. For example: To create new credentials, select Enter New. Credential Name - Enter a descriptive name for the credentials. For example: SCOTT_OBE Credentials. Authentication Type - Specify the Authentication type. For example: Basic Authentication. Client ID - Enter the database user name. For example: SCOTT_OBE. User names for Basic Authentication are converted to upper case. To include a case-sensitive user name, prefix it with the exclamation mark (!). Client Secret - Enter the database user name. Verify Client Secret - Enter the password. Oracle Application Express tests the REST Enabled SQL service. 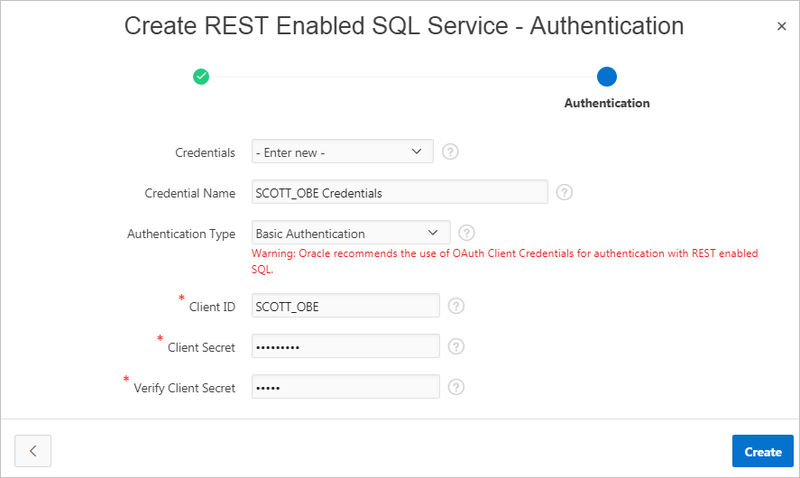 If everything has been done correctly (that is, you have included the correct URL, schema name, and password), the Test REST Enabled SQL Service message appears as shown in the following illustration. The REST Enabled SQL service appears on the REST Enabled SQL page.